BAIROV, N.M. & PAUWELS, O.S.G. 2015. Back to the question of a series of pit burials containing turtle shells from the Kumsai burial ground (Kyryk oba) Pp. 240-247 in: Materials of the International Scientific Conference "Development of the Kazakh Khanate: the epoche, events and personalities" dedicated to the 550th anniversary of the Kazakh Khanate, Aktobe, Kazakhstan [in Russian]. BEREZOVSKY, V.V., SAKHARBAYEV, A.A. & PAUWELS, O.S.G. 2015. Study of population dynamics of common species of birds in the North Caspian NCSPSA International Consortium facilities areas. Pp. 69-70 in: Abstracts. XIV International Ornithological Conference of Northern Eurasia. Almaty: 620 pp. [in Russian]. BURGER, M., PAUWELS, O.S.G., BRANCH, W.R., LÖTTERS, S. & RÖDEL, M.-O. 2005. 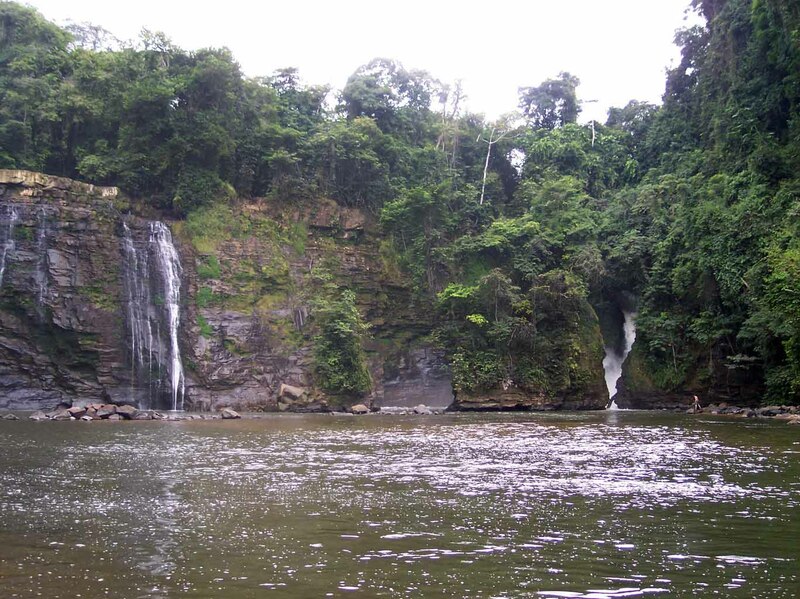 The Amphibia of Gabon: still a time for great discoveries. Pp. 123-124 in : 5th World Congress of Herpetology. Programme & Abstracts. Stellenbosch: 156 pp. DAVID, P. & PAUWELS, O.S.G. 2000. 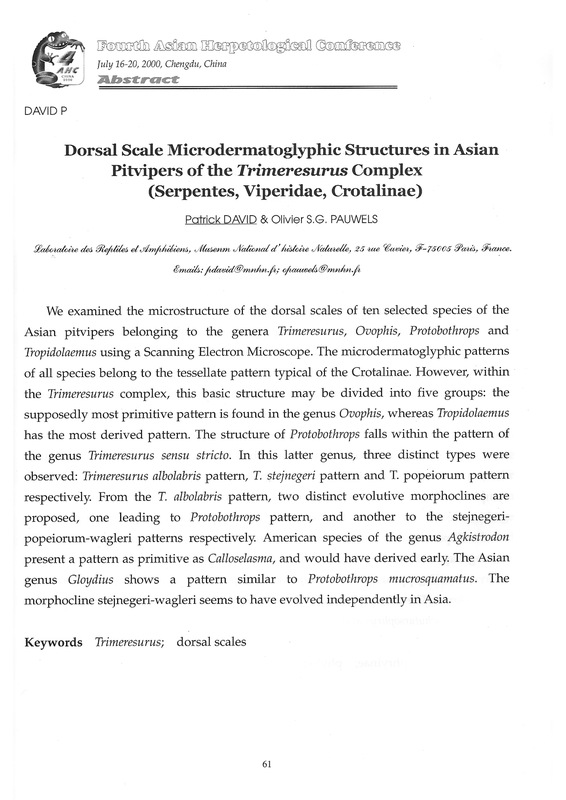 Dorsal scale microdermatoglyphic structures in Asian pitvipers of the Trimeresurus Complex (Serpentes, Viperidae, Crotalinae). In : Abstracts. Fourth Asiatic Herpetological Conference , Chengdu, China, July 16-20, 2000: 61. HENDERSON, A., LEE, M., ANGHER, G., BODDICKER, M., BURGER, M., CAMPBELL, P., LAHM, S., MC SHAE, W., O’BRIEN, C., PAUWELS, O.S.G., DALLMEIER, F., ALONSO, A., COMISKEY, J., ICOCHEA, J. & SOLARI, S. 2007. Correlation patterns of species richness and local rarity at a regional scale: implications for protected area designation. Poster 214. 21st Annual Meeting of the Society for Conservation Biology, Port Elizabeth, 1-5 July 2007. LOUETTE, M., MEIRTE, D., STEVENS, J., PLOMPEN, W., BIJNENS, L., HERREMANS, M., ADRIAENSEN, F., NÉRI, F. & PAUWELS, O.S.G. 1994. The biodiversity study on the Comoro archipelago. Pp. 67-68 in: IGBP and Global Change related research in Belgium II . Royal Belgian Academies of Sciences, Brussels. MEIRI, S., FELDMAN, A., NOVOSOLOV, M., ALLISON, A., BAUER, A.M., BERNARD, R., BÖHM, M., CASTRO-HERRERA, F., CHIRIO, L., COLLEN, B., COLLI, G.R., DABOOL, L., DAS, I., DOAN, T.F., GRISMER, L.L., HOOGMOED, M., ITESCU, Y., KRAUS, F., LEBRETON, M., LEWIN, A., MARTINS, M., MAZA, E., MEIRTE, D., NAGY, Z.T., NOGUEIRA, C. DE C., PAUWELS, O.S.G., PINCHEIRA-DONOSO, D., POWNEY, G.D., SINDACO, R., TALLOWIN, O.J.S., TORRES-CARVAJAL, O., TRAPE, J.-F., VIDAN, E., UETZ, P., WAGNER, P., WANG, Y., ORME, C.D.L., GRENYER, R. & ROLL, U. 2017. The global distribution of reptiles and its relevance for land vertebrate conservation. Oral presentation by S. Meiri at: 1st Israeli Conference for Conservation Science, Sde-Boker Campus, Ben-Gurion University, Israel, 3-4 April 2017. NAGY, Z.T., JOGER, U., VENCES, M., VIDAL, N., BRANCH, B., PAUWELS, O.S.G. & WINK, M. 2005. The African Colubroid radiation. P. 76 in : Abstracts of the Fifth World Congress of Herpetology, 19-24 June 2005, Stellenbosch, South Africa. Cryptoherpetologie et nomenclature, le probleme et sa solution. Oral presentation at: Congres d'Herpetologie de la Societe Herpetologique de France, Angers, 30th June - 4th July 1996 [in French]. Les limites de la cryptozoologie. [Résumés des interventions au premier colloque européen de cryptozoologie]. Cryptozoologia, 3 (9): 10 [in French]. Reptiles of Petchburi Province. Oral presentation at: Regional Southeast Asia Herpetology Training Course (Wildlife Conservation Society), Kaeng Krachan National Park, Thailand, 13 - 22 December 2002. Herpetological surveys in Gabon. Oral presentation at: Regional Southeast Asia Herpetology Training Course (Wildlife Conservation Society), Kaeng Krachan National Park, Thailand, 13 - 22 December 2002. New Thai reptile species discoveries in the 21st Century: implications for conservation. "Food for Thought" conference given at WWF Belgium, Brussels, 2 March 2017. PAUWELS, O.S.G., DAVID, P., CHIMSUNCHART, C. & VAN DIJK, P.-P. 2000. 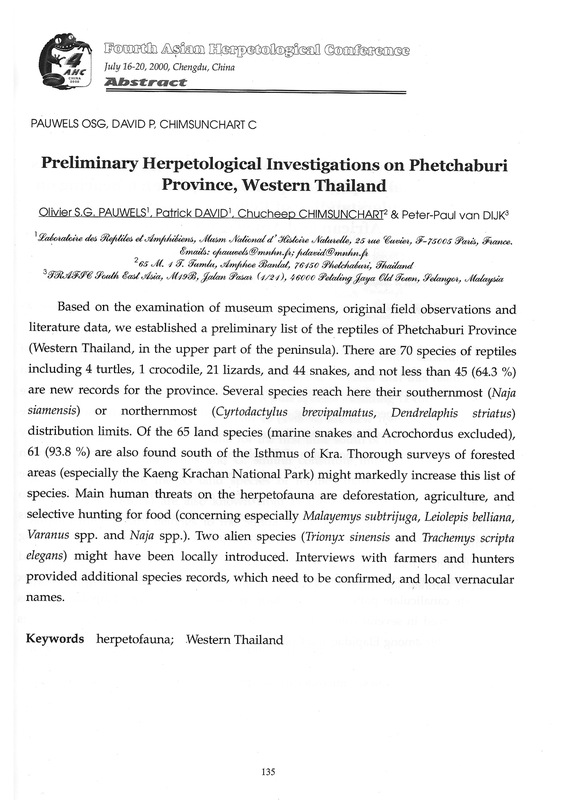 Preliminary herpetological investigations on Phetchaburi Province, Western Thailand. In: Abstracts. Fourth Asiatic Herpetological Conference , Chengdu, China, July 16-20, 2000: 135. PAUWELS, O.S.G., DAVID, P. & DE VOS, L. 2000. 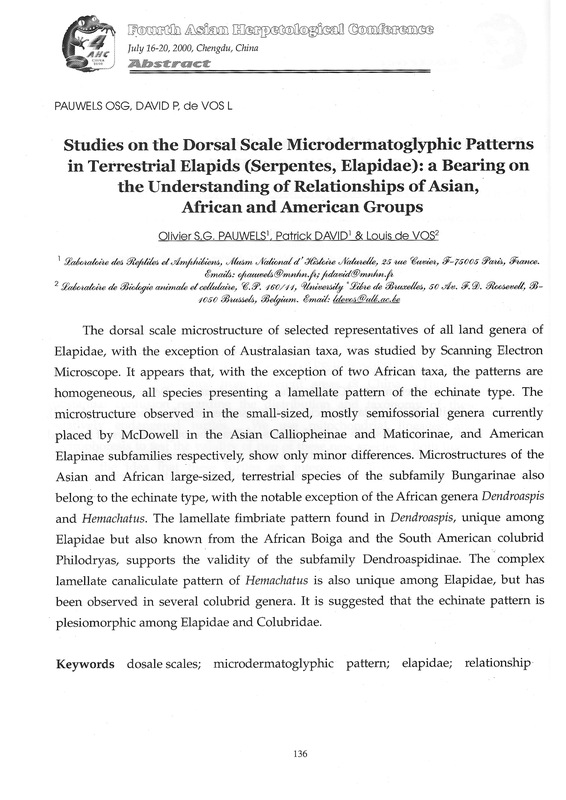 Studies on the dorsal scale microdermatoglyphic patterns in terrestrial elapids (Serpentes, Elapidae): a bearing on the understanding of relationships of Asian, African and American groups. In: Abstracts. Fourth Asiatic Herpetological Conference , Chengdu, China, July 16-20, 2000: 136. PAUWELS, O.S.G., LAOHAWAT, O.-A., DAVID, P., DANGSEE, P., PUANGJIT, C., CHIMSUNCHART, C. & BOUR, R. 2000. 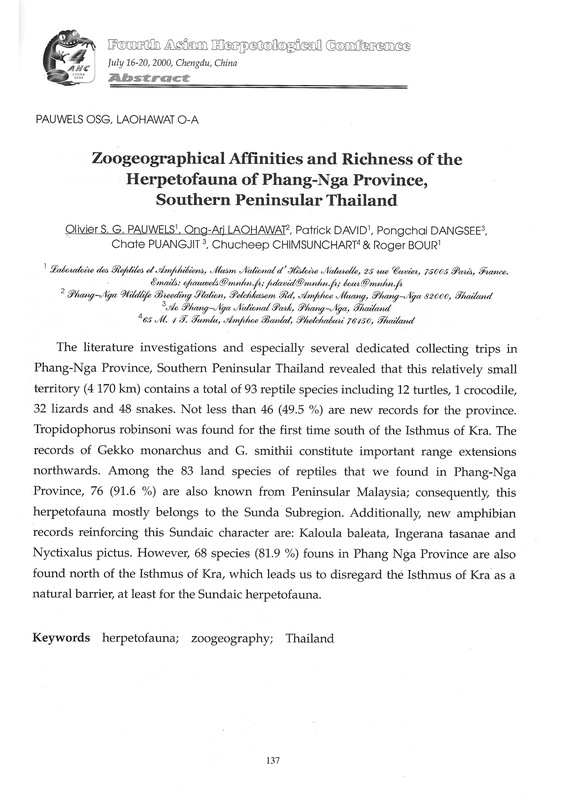 Zoogeographical affinities and richness of the herpetofauna of Phang-Nga Province, southern peninsular Thailand. In: Abstracts. Fourth Asiatic Herpetological Conference , Chengdu, China, July 16-20, 2000: 137. PAUWELS, O. & MEIRTE, D. 1997. Revision of the African water snakes genus Grayia Günther (Serpentes: Colubridae). Pp. 159-160 in: ROCEK, Z. & HART, S. (eds). Herpetology ’97 (Abstracts of the Third World Congress of Herpetology, 2-10 August 1997), Prague. PAUWELS, O.S.G., SUMONTHA, M. & ELLIS, M. 2016. Les geckos cavernicoles des grottes aménagées et exploitées de Thaïlande: diversité et problématiques de conservation. In: Abstracts. 44e congrès de la Société Herpétologique de France, 2e congrès franco-belge d’Herpétologie, Namur, 30 septembre – 2 octobre 2016. Société Herpétologique de France & Natagora. 36 pp. ROLL, U., FELDMAN, A., NOVOSOLOV, M., ALLISON, A., BAUER, A.M., BERNARD, R., BÖHM, M., CASTRO-HERRERA, F., CHIRIO, L., COLLEN, B., COLLI, G.R., DABOOL, L., DAS, I., DOAN, T.F., GRISMER, L.L., HOOGMOED, M., ITESCU, Y., KRAUS, F., LEBRETON, M., LEWIN, A., MARTINS, M., MAZA, E., MEIRTE, D., NAGY, Z.T., NOGUEIRA, C. DE C., PAUWELS, O.S.G., PINCHEIRA-DONOSO, D., POWNEY, G.D., SINDACO, R., TALLOWIN, O.J.S., TORRES-CARVAJAL, O., TRAPE, J.-F., VIDAN, E., UETZ, P., WAGNER, P., WANG, Y., ORME, C.D.L., GRENYER, R. & MEIRI, S. 2017. Global conservation targets for land vertebrates - lizards march to the beat of a different drummer. Oral presentation by U. Roll at: 28th International Congress for Conservation Biology, Cartagena, Colombia, 23-27 July 2017. Reptiles illuminate deserts and drylands as a missing component of global conservation priority schemes. Oral presentation by U. Roll at: 6th Drylands, Deserts and Desertification Conference, Sde Boker Campus, Ben-Gurion University, Israel, 6-9 November 2017.